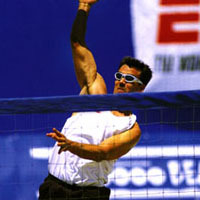 Heidger (HIDE-JER) has one Gold Medal finish with Kevin Wong at the 1999 international invitational in San Diego. He and Wong qualified for Sydney 2000 Olympic Games as the No. 1 United States men�s entry. Heidger and Wong placed second at the 2000 Mexico Open. Heidger also had three domestic seconds, including two in 1996 with Troy Tanner and one in 1998 with Brent Frohoff. A standout high school and junior college basketball player, Heidger started playing beach volleyball in 1989. His brother Nathan also played on the domestic beach tour. Heidger enjoys playing basketball in his spare time.